Send children to school in comfortable and practical clothing. Please avoid straps, complicated buttons, zippers and belts that can cause frustration. Children should be able to get in and out of one-piece outfits by themselves. For safety reasons, no flip-flop style sandals are allowed. Closed toe sneakers are the best for your child’s comfort and safety. For girls: No spaghetti strap tops. FCA school uniform policy allows emphasis to be placed on the character development and positive self-image of each individual student, rather than on external appearances. Uniforms encourage students to have a sense of school pride, thereby building confidence and self-reliance. Monogrammed polo shirts with khaki or navy uniform shorts, pants, skorts, or capris. The monogrammed shirts must be ordered from Ideal School Apparel. The shorts, pants, skorts, and capris can be purchased from a department store of your choice from their uniform sections or from Ideal School Apparel. The girls can also wear the monogrammed polo dress that must be ordered from Ideal School Apparel. CHAPEL UNIFORMS are worn on Wednesdays. Girls in grades K-3: the school plaid jumper with monogrammed Peter Pan collar blouse. Girls must wear shorts under the jumper. Solid color navy or white leggings may be worn with the jumper when it is cold. Boys in K-3: uniform shorts or pants in navy or khaki and the light blue monogrammed dress shirt. Shirts are to be tucked in and a belt should be worn. Girls in grades 4-6: A ¾ length sleeve white monogrammed shirt with the plaid skort or the school plaid jumper with Peter Pan collar blouse. Solid color navy or white leggings may be worn with the jumper or skort when it is cold. Boys in grades 4-5 is uniform shorts or pants in navy or khaki and the light blue monogrammed dress shirt. Shirts are to be tucked in and a belt should be worn. Middle School (grades 6-8) Middle school students do not have a special chapel outfit. They may wear a uniform polo every day Monday through Friday (Spirit shirts are allowed on Fridays, too). The jumpers, skorts, and the monogrammed dress shirts and blouses must be purchased from Ideal School Apparel. 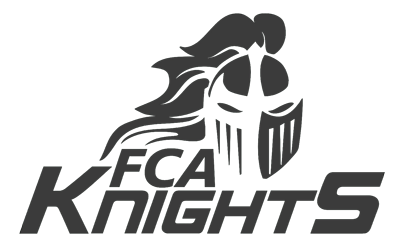 FCA Spirit t-shirts are allowed with blue jeans, blue jean shorts or uniform bottoms. The last Friday of each month will be a Friday Fun Dress Day with a theme (Examples: Cowboy Day, Favorite Sports Team, etc.) that will be announced on the calendar. If your child does not want to dress according to the theme, he/she may wear appropriate casual day clothes or the normal Friday wear. Sometimes the classrooms get cool. Sweaters can be worn in classroom, but they must be a solid green, solid white or solid navy sweater. Sweatshirts worn in the classroom must be FCA monogrammed sweatshirts that can be purchased through Ideal School Apparel. JACKETS AND COATS PURCHASED ELSEWHERE MAY BE WORN TO SCHOOL AND AT RECESS, BUT NOT IN THE CLASSROOM. Students are to wear closed toe shoes. No sandals, crocs or heels higher than 2”. Sneakers/tennis shoes and socks ARE REQUIRED for P.E. If your child’s socks show when wearing the uniform, they must be solid color socks that complement the uniform. Students are not to wear patterned socks or colors that do not match the uniform colors. BOYS: Hair needs to be neatly trimmed and combed and out of a student’s eyes. Earrings are not permitted. No extremes in hairstyles or hair color (no unnatural colors) will be permitted. Extremes will be defined by the Administration. Hats may be worn outside, but not in the classroom. GIRLS: Jewelry should be kept to a minimum. No extremes in hairstyles, hair color (no unnatural colors), jewelry, or make-up will be permitted. Extremes will be defined by the Administration. Hats may be worn outside, but not in the classroom. No tank tops or spaghetti strap tops. Shorts must be no shorter than 2” above the knee. If the shirts have images or messages they should be positive messages or images (not offensive or scary). You may purchase belts from any vendor. A belt must be worn with shorts or pants. PE uniforms are required for all Middle School students. PE shorts must be no shorter than 2” past their fingertips in length so please purchase the correct size for your student. Sweaters, jackets, sneakers, and backpacks must be labeled with student’s names or initials. We cannot be responsible for returning lost items. The dress code will be enforced for all students at all times while on school property. Please see that your child does not leave home with clothing that does not meet the standards specified above. After two written violations, students will not be allowed to remain in class if they are in violation of the school dress code, including hair. Parents will be called and expected to bring the student proper attire within a reasonable amount of time. The Administration of FCA reserves the right to make final decisions regarding student dress. Teachers will be instructed to send home uniform violations and follow through per handbook with consequences.